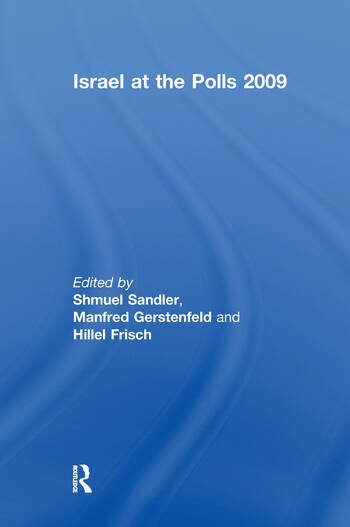 This book describes political and sociological developments in Israel before and after the February 2009 elections, alongside an analysis of electoral trends. It provides an effective analysis of contemporary political and sociological Israeli history. Rather than focusing narrowly on electoral politics alone, this book broadens its focus to make it relevant to undergraduate and graduate students in Middle Eastern, Israeli and Jewish studies and the liberal arts. Israel at the Polls has been updated and published annually for thirty years, providing readers with up-to-date analysis and continuity of scholarship; this book offers an expert long-term assessment of Israeli politics. This book was published as a special issue of Israel Affairs. Shmuel Sandler is the Dean of the Faculty of Social Sciences, and Sara and Simha Lainer Chair in Democracy and Civility, at Bar-Ilan University, and is a fellow of the Jerusalem Center for Public Affairs, Israel. Manfred Gerstenfeld is Chairman of the Board of Fellows of the Jerusalem Center for Public Affairs in Israel, and an editor of the Jewish Political Studies Review. Hillel Frisch is Associate Professor in the Departments of Political Science and Middle Eastern History, Bar-Ilan University, Israel.